It Could Be Worse, Packers Fans ~ The Bucky Channel - The World of Sports from Wisconsin's Perspective. I can not even begin to think how I would approach writing this article had the Packers lost to the Lions in their season finale. I'm not sure if I would have been able to find the words or emotions to accurately describe the feelings that would go with handing the Lions their only win in a 1-15 season. I don't even want to think about it. Thankfully, although it was scary at times, the Packers were able to come out on top with a 31-21 victory, and finish off a 6-10 season with a surprising amount of optimism. After snapping a five-game losing streak, I have no problem sticking to the positives. * Aaron Rodgers threw three touchdowns and passed for 308 yards, giving him a total of 4,038 in his first season as a starter. * Had two receivers end the game with more than 100 yards (Driver 111, Jennings 101). * Ryan Grant and DeShawn Wynn each finished the game with 106 yards rushing. Depending on how he progresses, it's not unreasonable to think Wynn could get a strong look at the starting job next season. * This was the first time a team had two rushers and receivers eclipse the 100 yard mark in their respective categories. * Had interceptions by their Pro Bowl starters, Nick Collins and Charles Woodson, who somehow only get interceptions in games in which they both get interceptions. * Mason Crosby barely missed what would have been the longest field goal in NFL history. * And oh yeah, helped the Lions become the first 0-16 team in league history. Shirts are now available. So the Packers season concludes with a game that was only interesting because of the futility of their opponent. It was a disappointing season, one that I've been surprisingly okay with. You're not going to the playoffs every year, and this just wasn't the Packers time. The reason I've been able to deal with the losses is that I see a pretty good team out there, in the hands of a pretty good quarterback. Off-season holes need to be addressed (offensive line, defensive line, Tony Gonzalez? ), and I'm hopeful Thompson will actually use some of his salary cap surplus. I would comfortably bet a large sum of money and human life on the Packers returning to the playoffs next season, and that relieves some of the disappointment. The season which will forever go down as "The Season After Brett Favre" really wasn't that much of a success for either the Packers or the Jets. But the year-long drama is officially behind us, and it's now time to look to the future. It's time for the fan-base to come back together and get behind a promising young Packers squad. Whether you're a Packers fan, a Favre fan, or both, it's time to remember that sometimes things just don't end up the way you'd like. The 2008 Packers were perhaps the best worst team I've ever seen. Someone needs to sit them down & show them the movie "Glengarry Glenross" ... "ALWAYS BE CLOSING!" Gotta close that deal each & every time. I like the state of the Pack right now. Sure they have to shore up the line on both sides of the ball, but the rest of the team looks pretty good. Aaron Rodgers must have been doing his homework before Brett jetted away to NY because A-Rod's transition was mostly smooth. I don't miss Brett one bit. I've been happy with him gone since the day he arrived in the Big Apple. A surprising number of local sports writers lamented over the trade once the Jets were 8-4, but those days are long gone. We saw the bad Brett down the stretch & I have a feeling that's the only Brett that's left. That's what happens when you don't put your all into preparing for an NFL season. An aging QB ran out of gas. I think the Detroit Lions are worse than that Buccaneers team in the sense that the former had two more chances to win with the modernized 16 game schedule AND because league parity caused in big part by salary cap helps teams like the Falcons & Dolphins turn things around quickly. The Lions however don't look like a team that will turn anything around quickly. After going 0-14 in 1976, the Bucs went on to win a combined 7 games from 1977-1978. I'm willing to bet a supersized McOrange drink that Detroit won't even match that total. It's pretty well-known by now that yesterday the Lions became the first team in NFL history to go 0-16. But did you know that yesterday the Packers also made history by becoming the first team to have two 100+ yd. receivers & two 100+ yd. running backs in the same game? 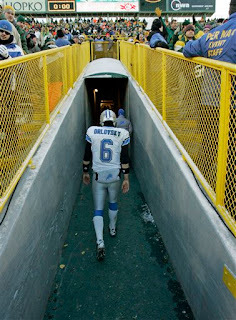 You know, I'm kind of surprised that I feel no glee whatsoever in the Lions' 0-16 season. If it was the Vikings or Bears, I'd be bouncing off the walls right now. But with the Lions, I just feel sorry for them. I was rooting like heck for the Packers to win yesterday, but it was much more rooting for the Pack to avoid embarrassment than for them to seal the Lions' fate. I've never really felt that hatred for that franchise--I think it's still the Barry Sanders effect. Anyway, it'd be kind of cool to see the Lions be competitive next year, especially if it means the Vikings or Bears aren't. Is it just me who is happy that that old fart in NY fell apart down the stretch. I guarantee you he doesn't give a toot he got Mangini fired. Winks, can you or your fantasy expert Fred slacks do some research - how many times has old balls led the league in picks and how many times has he led the league in td's? I'm curious. Also, am I the only one who doesn't like Dan Marino. For some reason he just comes across as a prick to me. I really wish Brees would've broken his record. And i really hate it how CBS had Marino do the rundown of the saints game and says "Drew Brees falls 15 yards short of my record." Brett Favre has led the NFL in passing touchdowns on four occasions (1995, 1996, 1997, 2003) and has thrice thrown the most interceptions (1993, 2005, 2008), with several second- and third-place finishes in each category as well. Thanks for the info Jonk. I should have figured Fred Slacks would'nt have came through.